How can I dispose of the waste products I get from working on my car more effectively? I have some real challenges disposing of various fluids and consumable objects from working on vehicles at home in my small workshop. How can I clean these parts effectively in such a way that I can minimise my chemical waste? How can I dispose of these properly in order to do minimal damage to the environment through land fill and pollution? tl;dr: You are doing a better job than most, and as a result reducing your chemical footprint further will largely require being more proactive about safe chemical disposal than most people are willing to be. Having said that, there are a few things to consider. Reduce the amount of waste that you generate where possible. The best thing I can suggest for reducing the amount of waste you need to safely dispose of is simply to reduce the amount of waste that you generate, and plan ahead to minimize the waste - especially from stuff that has a finite shelf life. Catch the Excess - If you change your own car oil then you probably have something that you use to catch the oil (such as an oil drain pan) as it comes oil of the car. Depending on what you are doing, you might be able to use an old bucket or large container of some sort to catch the chemicals. If you can contain them as you go instead of making a mess to clear up after you've finished working, it will be easier to dispose of them properly. An old sheet or mat you don't really care about could also work well to avoid quite so many chemicals being deposited straight in to land fill. Oil Disposal - You can recycle old oil through local oil distributors and auto-repair stations. Antifreeze - Take antifreeze to a household hazardous waste collection program, or you can check with local automotive repair shop or garage for advice. If your lucky they might take it off your hands there and then! Car Batteries - Recycle car batteries at the stores that sell them. The toxic lead in car batteries can contaminate groundwater. Both the sulfuric acid and the lead plates are reusable with only a modest amount of processing. In most places, when you buy a new battery, the vendor will charge you a small fee that's refunded when you return your old battery. And most of these shops will take in old batteries. The best thing to do would be to call them or visit their website. If not, the city or county you live in should have a place to drop them off, so there's no need to dispose of them illegally. Also, if you can properly maintain your charging system, the battery will last longer. This is why trickle chargers are such a good investment because a lot of times they may actually save you money in the long run! They do this by reducing the need for you to replace your car battery at such frequent intervals. Brake Fluid - Easy if you have a cat. 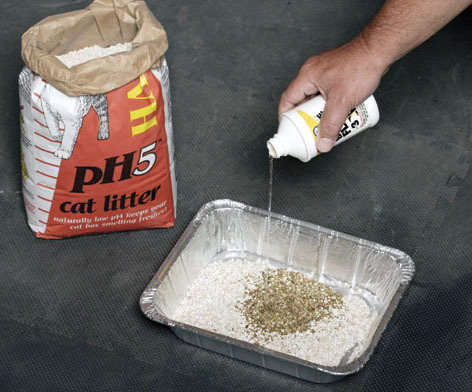 Pour brake fluid into a tray of cat litter and leave it in a safe, well-ventilated place. It will evaporate within a few days. Try to place it high if you have a dog as well because it may poison them otherwise. Brake fluid is alcohol-based. It's toxic when ingested. When bleeding brakes, catch the runoff in a jar. Brake fluid from a jar that's been opened for more than a few months probably has absorbed enough water to reduce its boiling point past the point of safety. It is a flammable fluid so you must keep it away from any sources of ignition! Well... unless you are trying to cause a house fire. I do not recommend that though. If you don't think you will need that much brake fluid, you can buy brake fluid in 8-ounce bottles instead of quarts to keep it from going bad so often. All goes towards my main point about only generating waste where absolutely necessary. Drain Your Filter - You can leave your oil filter to drain overnight, enabling you to save slightly more which will all add up in the long term. Oils and Filters - As I mentioned, an oil drain pan is a handy thing to have. They tend to hold about 10 quarts, which is enough for a couple of oil changes. It also has a tight-fitting lid to keep the oil inside until you're ready to deal with it. This means you only have to handle the oil every other oil change, potentially reducing waste. It also has a grate to hold the filter to allow it to drain completely. Let it drain for several hours or overnight (this would be ideal). Commercial shops are required to crush or puncture the used filters to facilitate draining. When it's time, transfer the used oil in to a few clean, dry plastic bottles (empty milk jugs are brilliant for this) and label them as used engine oil. Remember that oil can be purchased in gallon jugs instead of single quarts, making it easy to reuse the jugs. Buy this size if you can find it. They are normally cheaper per unit volume than the smaller ones as well. I know my knowledge of America may be lacking here, but as far as I am aware in most states, any shop that does oil changes is required to take at least a modest quantity of used oil from consumers. The used oil is either recycled back into other petroleum products or burned in special furnaces for heat. Take it to a shop, they will recycle or reuse it better than you can. If you do buy your motor oil in quarts, remember to drain the last few drops of oil out of each plastic quart bottle. An hour of draining upside down, multiplied by the residue of four other quarts (one oil change's worth), is often a couple of fingers of oil. Save this for your oil can, for topping off the lawnmower or any other uses you may have for the stuff! Now the empty plastic bottles can be tossed into the recycling with the household plastics, without contaminating the entire recycling infrastructure with oil. Note: One thing to note is that if you can keep your air cleaner fresh and well sealed, it will prevent airborne dirt from contaminating your engine oil. Coolant - Coolant is one thing that you can actually drain in to a pan for use as a weed-killer in your yard, garden and alike. A commercial shop can't dispose of it down the sink or outside drain anymore (by law) and neither should you. Drain the radiator into a pan, with as little spillage as possible. Fill the system with water and run it until the engine warms up enough to open the thermostat, and then for a few minutes longer so as to allow it to mix thoroughly. Drain it, fill it and drain it again. This double flush will purge 99 percent of the old coolant. Now you can refill with the correct amount of fresh coolant and top off with water. Did you know that many larger shops have coolant recycling machines? These actually distill the glycol out of the old coolant, and the shop can add an additive package and reuse it as if it were new. The water boils off and all that's left is a few teaspoonfuls of sludge. Call around to find one of these machines, and the shop will probably let you drop off your old coolant. But there's one very important caveat! You must use a clean drain pan and funnel, and clean containers to ferry the coolant. If you use the same drain pan for oil or other solvents and even a few drops of oil wind up in the coolant, it can't be recycled. If you can do this, then using a machine is by far the best way to dispose of your old coolant. Dispose of Paint and Fuel Using Evaporation - Most automotive paint used in the aftermarket is solvent-based, either enamel or lacquer. A lot of new cars are painted at the factory with waterborne paint systems. Many rubbish dumps or land fills won't take this type of paint or any of its companion thinners as waste. If you have a secure, well-ventilated place, one that isn't likely to start a fire or poison children or pets, you can do what you can do for small quantities of leftover or contaminated paint thinner and automotive fuel is just leave the can containing the fluid open in a safe, warm place until it dries completely. Don't try this with coolant unless because it will take way too long, though you could speed up the evaporation process by boiling it. I wouldn't recommend this, especially if you live near a machine that will take it. Larger quantities should go in to the hazardous waste system. The common fuel additive called MTBE is turning into a major issue as a groundwater contaminant. Hopefully, this post will help prevent that from getting too much worse! Tires - Your best option here largely depends on your geographical area. You may need to do your own research as to what is best for you due to this, but here are a few common options to consider. Some areas recycle tires by using them as supplementary fuel in cement kilns. The very high temperatures required to drive the water out of limestone and transform it into portland cement also ensure the complete combustion of the rubber and fabric in tires. A side benefit is the molten steel that collects in the bottom of the firebox. If this is not an option for you, most shops that sell tires have a way to dispose of old tires, although they may charge a small fee. Some municipalities will take a few tires from a homeowner, either on regular rubbish day or at a special time or place. Note: One thing a lot of people seem to overlook when it comes to making your tires last longer is alignment. Keep your suspension properly aligned and rotate your tires to reduce tread wear. Some garages might do this for free or for a very reasonable (small) fee if you ask them to. Buy What You Need - Buy only as much paint, solvent and other such items as you need for a project. If you'd done this all along, you wouldn't now need to dispose of a half-empty can for a car you haven't owned for 30 years or more! Depending on the setup of your workshop and how much space you have, you may also find something like this very helpful. To reiterate my initial point, just try to use any harsh chemical solvents and cleaners in moderation - and why buy more than you are going to use anyway, right? As a non-environmental side note, have you heard of Butanone (a.k.a. methyl ethyl ketone)? Its not very nice to the environment but does a great job cleaning cylinder heads, axle bearings, calipers, crankcases and all that sort of stuff. It is soluble in water and is commonly used as an industrial solvent. It is also used heavily in the aviation industry. Make sure you dispose of it (or anything similar) properly using one of the methods that I have mentioned above. I didn't see it mentioned in this related post that Zaid pointed out, so I thought I'd mention it. Not the answer you're looking for? Browse other questions tagged battery brake-fluid carb-cleaner environment toxins or ask your own question. How do you remove or even get to the car battery on a 2012 Honda Odyssey? Which car parts require more energy than the starter? Can I jumpstart a non-hybrid car from a hybrid or full electric car? How can you use the headlights to tell the quality of your battery? How can a fuse drain a car battery? How can I find the date code on my battery? Can a faulty Car self starter damage the battery?